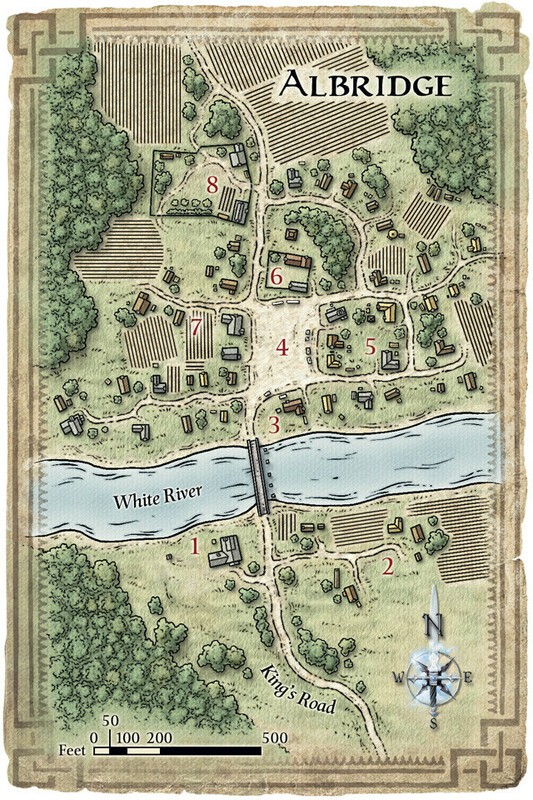 I'm currently thinking about the Battle of Albridge in my Reavers of Harkenwold campaign. The bridge is a big bottleneck. The troops of the Iron Circle are mostly composed of melee fighters and some artillery, with a small number of tar devils, dark adepts, and Nazin the Warlord (an elite Soldier). What tactics would you recommend for my evil armies to use? How should I setup my troops, and how should I gain a bridge-head into the town? I don't think it's very realistic to have them deploy canoes from the rear once they get to the river side. What do you think? 1 - EXPOSURE: That bridge is brutally open, making it a natural murder zone if the defending force is prepared with missiles or skirmishers. Reducing line of sight to the bridge is of critical import. Consider using fire from your artillery (clay pots filled with flammables and/or greek fire, will get stuff burning but good) to create a smoke/hazard from a distance (building 3 is a convenient target). That will hopefully create a natural wall of fire/smoke to screen your crossing. Various spell effects will help you get troops across while taking a minimum of casualties. Good use of your ambushers from the east to create a skirmish/distraction will help pull attention away from your crossing as well. Anyway you slice it, though, you're going to have to cross under fire and into resistance. Consider pavise-style portable-cover on wheels to screen from the worse of it, or other variants on a battering ram/siege tower to cross the river if they go with missiles. 2 - PUSH OF PIKE: Once the crossing is secured from missile fire, they'll seek to deny you the physical ability to cross. Pike phalanx would be my go-to option with swordsmen mixed up among the front rank to handle anyone who got under the spears. It should go without saying that you're going to want your heaviest vanguard on point for the crossing. Think 'wrecking ball' and you're in good shape - but a slow moving one. The good news for pike formations is that they're bunched up - prime AoE ability fodder. 3 - AREA DENIAL COUNTERMEASURES: Expect them to consider blowing the bridge as a real option, especially if they're out-classed. You'll want counters to obvious spells and abilities that could damage the bridge - ESPECIALLY when your vanguard is crossing it. 4 - AIR SUPPORT: I don't know if Tar Devils can fly but if they can, or if you have any other airborne units, use that. Drop buckets of burning pitch, greek fire, whatever you can to disrupt enemy formations, break down their line of communication/sight, and otherwise foul up their day. Ideally use something you can selectively extinguish, to prevent your own forces from falling into the same trap. 5 - ONCE ACROSS: Feed your own pike wall equivalents and establish an expanding schiltron. You are at your most vulnerable when half of your forces are across, that's when a savvy enemy will hit you, and try to bust the bridge if they haven't already. If they can split your force in half they can apply their full pressure to half your strength and then mop you up. An educated commander will expect this. As with your group, they decided to try to hold the forces at the bridge, but they didn't have enough time for the Harkenwold Rebels to get set up, so I had the first encounter be a delaying action - a sort of combat-challange hybrid, as described here: Non-combat objective: Delay larger enemy force and my answer to that question reflects how it acutally ran. 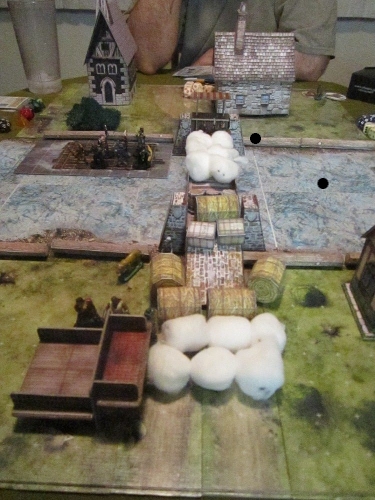 Then, I had the defense of the bridge with each PC in control of 6 rebels (minions). You can see a photo of the start of the encounter of it in this question (the second image, copied here). Holding the bridge doesn't prevent the final encounter, which I had happen at Dar Gramath's Stables, but weakens the Iron Circle forces that arrive, since they had to go the long-way around. I made Dar a 1st level Rogue NPC under a player's control, and he did a pantload of damage against Redthorn (thanks to the parties various buffs...) - he barely escaped with 1 HP! If there is enough request, I'll post the complete encounter descriptions for the Defense of the Bridge and The Revenge of Redthorn. 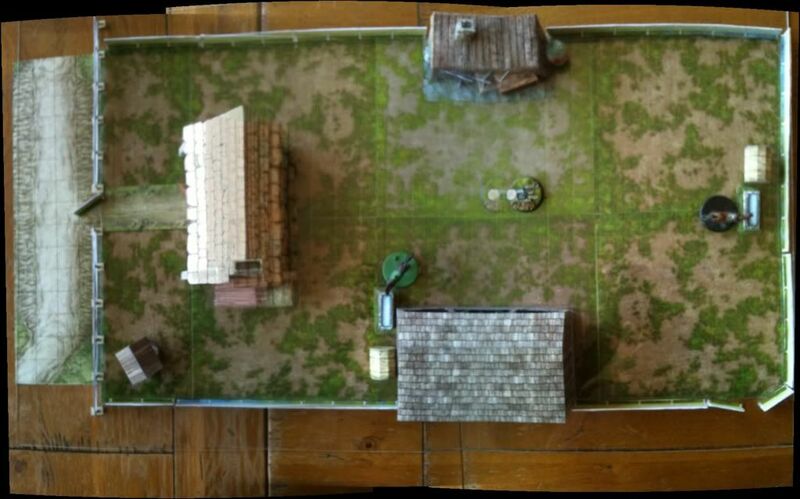 Ok, to summarize, here's what we ended up doing: I told the players what they could know about the enemy troops. Numbers were about matched, but enemy troops had better training, armor, and weapons, so ultimately the victory would depend on the characters fighting a decisive battle (this was unsaid). The characters built barricades trapped with explosives over the bridge, traps on the King's road south of town, and even devised a catapult that they tried to build with the local smith's help. They also helped appease some hotheads and inspired the troops with a very uplifting monologue (courtesy of my shyest player, who really got to shine there). Finally, they set up some scouts on the road and archers in the tower south of the river. After that, I had the enemy move in early in the morning, taking advantage of the morning fog, and marching in "testudo" formations over the bridge. I used coins to represent the troops, and gave a +1 bonus for each 10 troops to the players, and a +2 for each 10 enemy troops (to represent the better training and equipment). 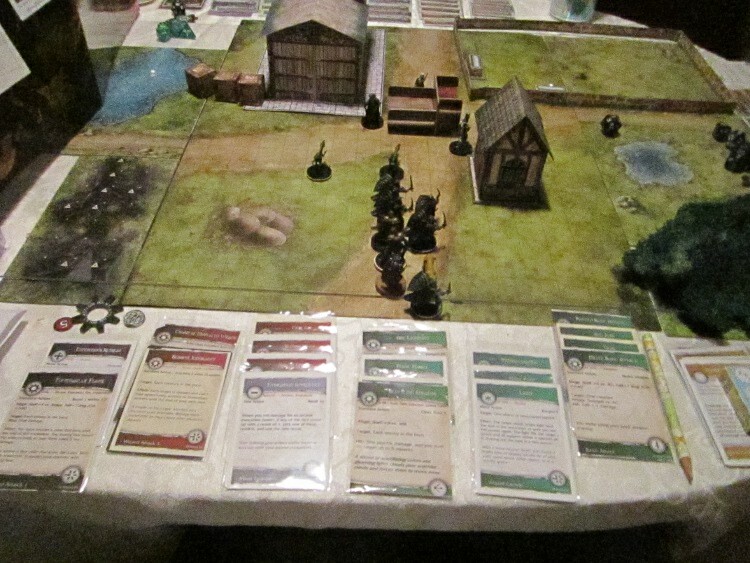 With these bonuses, each movement or tactic was decided with opposed dice rolls. Long story short, the players managed to block the enemy on the north side of the river, the latter having established a precarious beach-head there. At this point, the remaining enemy troops attacked from the east, and the players had to jump in to save the day. We managed to fight one encounter (there are three encounters, I skipped the first one), and we wrapped up with the enemy leader arriving and shouting profanity at the characters. Not the answer you're looking for? Browse other questions tagged dnd-4e published-adventures tactics or ask your own question. What is a good method for storing papercraft buildings and the like? What are some good sources for combat tactics for a GM to use? Is there a system that takes tactics over skill, and skill over dumb luck? What do strategy vs tactics mean in tabletop RPG combat? How hard is too hard for monster tactics?